I was so excited when I saw this week's #SundaySupper theme: One Pot Recipes. As a busy woman, I love it when I can make something that tastes great and minimizes mess and cleanup in my kitchen. Meals that are cooked and served in the same dish mean less cleanup time for me after dinner, which is never a bad thing! Our hostess Amy from Kimchi Mom encouraged us to come up with our best dishes that can be made and/or served in one dish, pot, skillet, etc. As you may have noticed, I've been on a bit of a Tex-Mex kick lately. Today 's recipe is an easy spin on one of our favorite snacks and game day foods: nachos. What's not to like about crunchy tortilla chips with a mountain of flavorful toppings? I can think of one thing: when the chips start to get soggy...ick! My Beefy Nacho Baked Skillet solves that problem by keeping the toppings separate from the chips and serving them in a skillet. Imagine layers of spicy beef, tons of melted cheese, a confetti of colorful veggies, sour cream and guacamole! Then imagine spooning the topping directly on top of sturdy, crisp tortilla chips and munching away. No more soggy nachos! We loved sitting around the table with this skillet and baskets of chips and assembling as we went. This serving method also allows the nacho topping to stay warmer longer. Double score! Step 1: Add the olive oil to a large non-stick skillet over med-high heat. When the pan is hot, add the ground beef, diced onion, and salt & pepper. Cook until the meat is browned and the onions are soft; drain any excess fat. Add the drained diced tomatoes, corn and taco seasoning. [NOTE: If using a dry seasoning packet, follow instructions for how much water to add.] Stir well to combine and bring to a boil. Reduce heat and cook until reduced and thickened...about 10 minutes. This gives you time to prep the veggies for the topping. Step 2: Preheat oven to 350. Top the beef mixture in the skillet with the shredded cheese. Make sure the top is evenly covered so every bite will be super cheesy! Bake until the cheese is melted and the beef layer is bubbly. Step 3: Top the cheese with the shredded lettuce, chopped tomatoes and green onions. Scoop the guacamole and sour cream onto the cool lettuce...that will prevent the sour cream from "melting" too quickly. Bring the skillet to the table, along with baskets of sturdy, thick tortilla chips. Let everyone use forks and/or spoons to place some of the mildly spicy nacho ingredients directly onto the tortilla chips. I also like to serve tostada shells spread with refried beans, which I like to call "Texas-sized nachos"!! Both presentations are fun to make...and to eat. The main idea is to have fun! 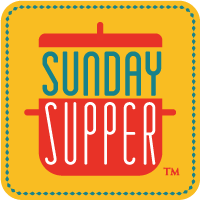 Make sure to join us this evening at 600 CST for our weekly #SundaySupper Twitter chat...where we'll be sharing our ideas for great one-pot recipes. In the meantime, make sure to check out the other great recipes that my fellow #SundaySupper contributors are offering. There's something for everyone, so stop by to say hello to them!